The daytime was attended primarily by female students, aged 16 – 18 and the evening by over 300 women, potential parliamentary candidates! Each plenary session & seminar was facilitated by women in politics from a mixture of political organisations including 50:50 Parliament, Liberal Democrat Women, The Women’s Equality Party, Women2Win, Labour Women’s Network, the Conservative Women’s Organisation & the Parliament Project. The inspirational opening session was chaired by Frances Scott, Founder and Director of 50:50. Six women working in politics talked about their career route into politics, motivating the young audience. The speakers came from a variety of political persuasions, backgrounds & experiences. The overriding message that came through from the anecdotes & straight guidance was get stuck in! “Working in politics is about DOing something, not being something.” Fiona Mactaggart pointed out (President of Fawcett and ex MP). If you see something you don’t like, campaign for change. “Get involved. The future can only be built by you” said Catherine Mayer, who founded The Women’s Equality Party (WEP) in 2015 in order to push feminist issues up the agenda. WEP now boasts over 65,000 members. Seyi Akiwowo, a British Nigerian had certainly been actively getting stuck in & making her voice heard for quite a while! While she was at school a teacher channelled her questioning of the status quo by encouraging her to become a member of the Youth Parliament. After that she progressed to the Youth Council & finally the European Youth Forum in Belgium. She successfully stood for her local council aged 22 years old. Seyi is the CEO & founder of GlitchUK as “online abuse is removing women from the public space”. 50:50 hosted the inspirational seminar “Why Stand?” where Rosie Duffield MP and Helen Grant MP presented. The answer is clear: “Because representation shapes policy! If you want to change things you have to be in power.” It is crucial for women not to let the fear of online abuse silence them. If you notice women getting negative trolling take action by sending the same woman a positive message. Baroness Burt of Solihull was on the panel. When she was an MP she increased the vote for the Liberal Democrats in her constituency by 35%. She acknowledged that another common internal dialogue of women was the question of “Am I good enough?”. Her response to this “You are better than you imagine yourself to be”. This message amusingly reiterated in a fantastic seminar led by Fleur Butler & Claire Reynolds, entitled How to Build your Political CV. Fleur pointed out how many mediocre men were in politics, who don’t know an awful lot about anything. The overriding message is – You are good enough! During an informative session on the different careers available within the political space, Hannah a Field Organiser (Labour) told one of the most memorable anecdotes of the day which highlighted the misogyny of some of the US electorate. Taking part in the Obama campaign in North Carolina, Vanessa was sent off to ‘door knock’ and canvas in a heavily Republican area. Obama(Democrat) was running against MaCain (Republican) who had just appointed Sarah Palin as his vice-presidential candidate. At one home, a man emerged with his three adult sons, who happily explained that although they were Republicans (ie MaCain supporters), they drew the line at voting for a party that had a female second in command & would be voting for Obama (Democrat), with the parting shot of “I mean, would you want your wife in charge?” Obviously our answer to that question is a resounding YES! What is it like to work in Politics? Venus had been a policy advisor for the Liberal democrats, she declared “If you get involved in Politics, you can amplify people’s voices” and Freya declaring that “Working in politics is quite fun”. Helen Grant, Conservative MP, said she was “never bored”. Like so many other jobs, the skill set identified included having emotional intelligence, being a good listener, working out where barriers to change are, trying your best, being persistent and tough. Jobs available included being an MP, councillor, special adviser, field campaign worker & of course, the PM! For MPs, days could be a variety of dealing with constituent emails or face to face meetings or going to a debate. Vanessa had been a special advisor (SPAD), which was identified as a route into becoming a candidate for parliament. She pointed out that “politics is more collaborative than you think”. This was perhaps the most enlightening & pleasing learning of the entire event for me. Witnessing women with political differences both working together in select committees & sitting together as friends and peers was enlightening, refreshing & stimulating. As the 50:50 Parliament presentation amplified: diversity leads to better decision making, although we are not always going to agree, we can respectfully disagree. Research has shown that more men will stand up for women’s issues, if there are more women in the room. This is a natural behavioural change. Women should have an equal say on all issues. The 50:50 vision is that women and men run the country and plan the future together in equal numbers. 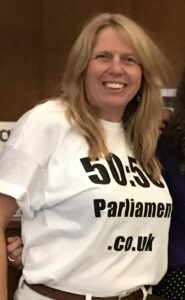 We can change the dynamic of decision making by having more women in the room so let’s ask women to stand via 50:50 Parliament. 50:50 will help them along the way to Westminster .